The barrier islands are one of Virginia’s last great wilderness areas, virtually uninhabited by humans. They have one of the longest stretches of undeveloped coastline on the eastern seaboard, and the longest stretch of undeveloped barrier islands in the global temperate zone. The roughly 23 islands that make up this group are owned by The Nature Conservancy, (TNC), the Department of Game and Inland Fisheries, (DGIF), and the Department of Conservation and Recreation, (DCR), among others. In the fall of 2014, when I started graduate school at VCU, (Virginia Commonwealth University), I was new to a lab that focused on coastal plant ecology, specifically on those Virginia barrier islands. At that time, our island of focus was Hog Island, which is almost eight miles long and up to about half a mile wide. 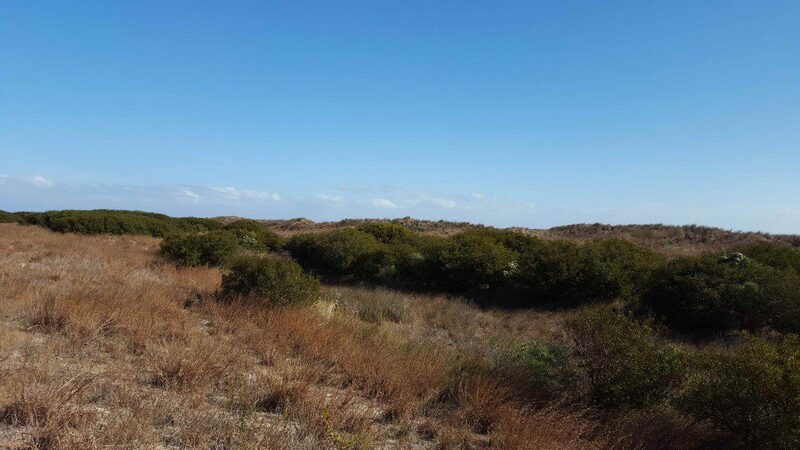 Dune swale community on Hog Island with Wax Myrtle and Little Bluestem among other species.. Primary dune in the background beyond which lies the Atlantic Ocean. A project about nutrient enhancement was proposed to me for my Master’s thesis, but I was more interested in the Wax Myrtle, (Morella cerifera) shrubs, which are mysteriously encroaching across the island. I will say right now I did not discover why they are doing so, nor did I attempt to find out (there are ideas, but nothing known for sure). I decided instead to investigate their impact on the island’s microclimate; that is, the effect of the shrubs on nearby biotic and abiotic factors; mainly temperature, soil nutrients, and plant community composition. The studied area included space from ten meters inside to ten meters outside the myrtle thickets. Wide, low relief/low energy beaches of Hog Island on the south end facing north. off to prevent the boat from getting beached. From there it was long walk around the south end of the island and then back up north on the seaside to my expected study site. Either that or we could cut through the marsh, a shorter but harsher trip with mud, mosquitoes, ticks, and biting flies. Of course we took the beach walk. Along the way thousands of endangered Northeastern Beach Tiger Beetles scurried at our feet. Piping Plovers among countless other shorebirds did their bird version of yelling at us to get away from their small section of beach. 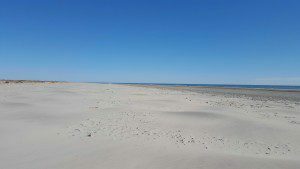 And being an uninhabited, somewhat remote island, thousands of giant whelk shells and other treasures decorated the massive flat beach. I left the crew behind to work on their site at the south end of the island. A couple miles north I cut west over the huge primary dune, into the heart of the island, an entirely different habitat from the adjacent beach, where the grasslands and Wax Myrtle thickets dominated. To call them thickets may be an understatement. Some of them had as many layers of leaves from ground to canopy (Leaf Area Index) as a rainforest, and they were only a few meters tall! To get inside one must crouch, crawl, and slither. You could bet as soon as you got inside you would immediately be swarmed with a plague of mosquitoes, regardless to the volume of DEET that burned your face. I soon learned that bug nets were the preferred option. Permethrin for the pants and socks, because the ticks in the leaf litter were as bad. This was the habitat, far from any human settlement, that I all alone, would conduct my first ever real scientific experiment. 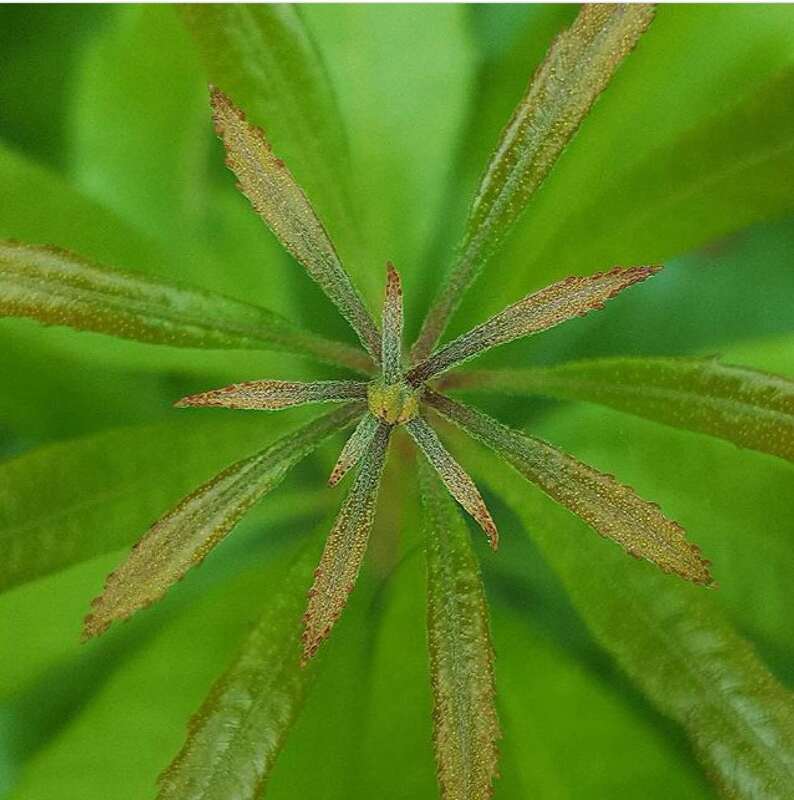 Young Wax Myrtle close-up showing clear spiral pattern of leaf growth and leaf glands (not on Hog Island). The Wax Myrtle, or Southern Bayberry (Morella cerifera) is an awesome plant, great for landscaping within its range due to its hardiness, evergreen nature, and attractive fruit. A lovely addition to the shrub community in many coastal plain habitats, it specializes in sandy mesic areas. I first learned about it in Vascular Plant Systematics with Dr. Martha Case at The College of William and Mary. Then (2011), I learned the genus as Myrica, a name I still prefer to the current Morella synonym. Nonetheless, it was a common shrub around the beautiful Lake Matoaka which was at the center of the College Woods on William and Mary’s campus. Wax Myrtle fruiting on Hog Island, Winter. Frankia form nodules with the roots to fix atmospheric nitrogen which the plant uses for nutrition. It occurs in the wild from Central America and Texas east and north to New Jersey, hugging the Coastal Plain throughout. The glandular leaves, (0.5 ✕ 1.5 cm, 4-6 ✕ as long as wide), which spiral elegantly around the twiggy stems, are often, but not always, serrated towards the apex of the leaf. They range from a lush green when young and happy to an olive tone when aged. When in a more stressful high sunlight area, the leaf glands are more obvious and the olive-orange color becomes more apparent. Like other species, sun leaves can be much smaller and thicker. On the barrier islands they were often tiny, leathery, and seemingly writhing, possibly due to the light intensified by reflectance off the sand. Separate male and female plants bear axillary catkins late winter into spring, thought to be wind pollinated. Fruit, (2-3.5 mm in diameter), which appear in the late summer throughout winter are dry, waxy, blue berries, loved by birds of all types and critical on the islands which act as a funnel for migrating songbirds. Once you positively ID your first wax myrtle, there is one thing you must do to etch it into your memory and assure future IDs, smell it! If they don’t, Yankee Candle should have Wax Myrtle scented candles, made with real Wax Myrtle wax. I’ve got a vial of wax concentrated from fruit scarified for a doctoral experiment in our lab; I carry it around in case I need to take a whiff and carry myself back to the island, momentarily escaping a mundane work day. It’s a lovely smell that is unique and difficult to describe. In fact I don’t think I will even try, go find some and discover it yourself! 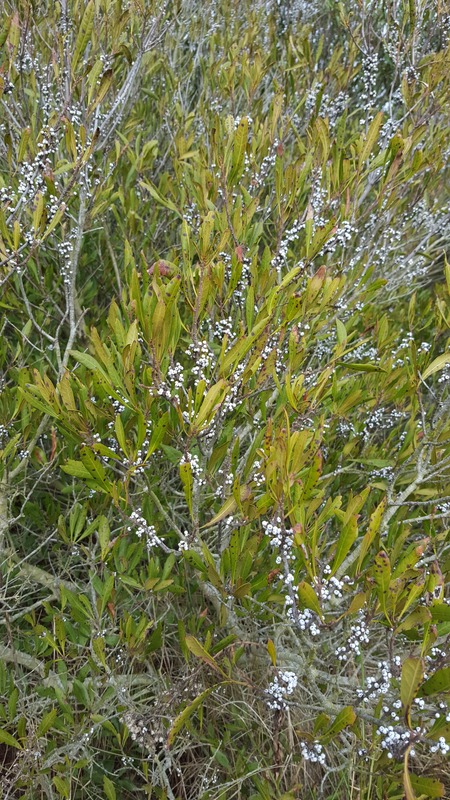 What were the effects that I found of Wax Myrtle on the barrier island’s microclimate? They were significant and compelling. Stay tuned for Part Two. Panorama of Hog Island with left side of photo facing south and right side of photo facing north. Photo shows Wax Myrtles, dominant to the north, expanding and becoming dominant southward. *Specific measurements taken from Weakley’s Flora of the Carolinas, Virginia, Georgia, and surrounding areas. 2007. Want to receive the next installment in your email? Connect with this blog series and all of our posts by subscribing below. Great article -reminds me of my experience on the Outer Banks 30 years ago as an intern at NC Marine Resource Center. The protection from the wind the wax myrtle offers and their ability to withstand the elements is amazing! Thanks for sharing your experience, Mary. We have to appreciate our native plants!